Intensifying its protests mainly in the opposition People’s Progressive Party (PPP) stronghold of Berbice against the closure of sugar operations there, the Guyana Agricultural and General Workers Union (GAWU) has called on government to hold a referendum on scaling down the Guyana Sugar Corporation (Guysuco). GAWU President, Komal Chand addressing a rally of Guysuco workers, business owners and residents at Skeldon. GAWU President, Komal Chand accused government of breaking its 2015 general election promise that the sugar industry would not fail and said the time has come for a referendum on the future of the sugar industry. “If tell the people ‘vote for me and sugar is too big to fail’ and you come now and you want to close the sugar , you suppose now to go to a referendum….Hold a referendum on sugar. Government must hold a referendum. Let the people speak,” he told a public meeting Tuesday morning at Skeldon. About 2,000 persons, including sugar workers and business owners, participated in a march and rally to vent their frustration against plans to sell the Skeldon, Rose Hall and Enmore estates. Wales has been already shut down. Aiming to produce 174,000 tons of the sweetener annually, government last month announced that Guysuco’s sugar operations will be limited to the Albion-Rosehall, Wales-Uitvlugt, and Blairmont factories. PPP parliamentarian, Dr Vishwa Mahadeo accused government of disrespecting the sugar workers by not consulting with them. “The sad thing in all of this is that decisions are made without consultation with the people. Did (President David) Granger and his people come and consult with you? Did the Minister of Agriculture come to consult with you? Did anybody from the government come to consult with you? So how can they decide what to do with your livelihood without talking to you?” he said. 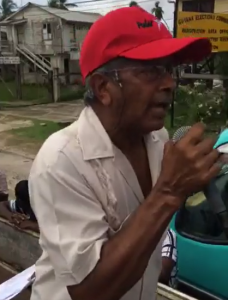 Mahadeo warned that “we are not going to take this lying down” and that plans are a foot to stage larger protests. Charging that government failed to put details in its White Paper on the sugar industry, the GAWU President slammed the David Granger-led administration for being opposed to consultation and transparency on the sugar sector. He cited the recent decision by the Speaker of the National Assembly to block the bipartisan Economic Services Committee from visiting Guysuco’s operations this week. 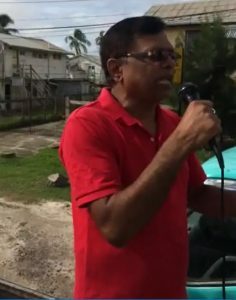 PPP parliamentarian, Dr. Vishwa Mahadeo addressing the GAWU-organised after-march rally against the closure of several Guysuco estates. “What right the Speaker has to interfere in the work of the Economic Services Committee? What is wrong for the people in the Economic Services Committee to come and hear from the people directly because the Economic Services Committee is now discussing sugar?,” asked Chand. The veteran union leader warned that with the closure or shrinking of a number of sugar operations, medical benefits and drainage and irrigation services would go. Government, in its White Paper on Guysuco, has said those non-core operations would be taken over by central government. The GAWU President warned that while government was aiming at cutting Guysuco’s operational costs, closure of sections of the corporation would see the government spending much more on combating crime and other social problems such as divorces and more uneducated children.”It is better to invest in sugar and save sugar,” he said. Similar concerns were echoed by Dr. Mahadeo if government puts profit before people. Chand called for larger protests, regardless of race, to push for the preservation of the more than 10,000 jobs in the sugar belt. “This is not about Black people, and Indian people and Portuguese people and Chinese people. This is about the workers. This is about the vendors. This is about the lady who selling bajee , who selling bygan, who selling fish, the fisherman, the taxi man, the tailor,” he said. The GAWU official questioned how GYD$30 billion could have been spent on Guysuco last year and a mere 189,000 tons of sugar were produced. He flayed management for the failure of industry.